Introducing!! Next-generation flexible hyaluronic acid dermal fillers that provide natural-looking results through XpresHAn Technology, creating gels that offer a range of flexibility and support. These new products are flexible and are designed to meet different patient needs. Restylane Refyne and Defyne are formulated to act like your body’s own naturally occurring hyaluronic acid (HA), restoring volume to your skin. Using unique XpresHAn technology each product is designed to give you just the right amount of lift, along with the flexibility to show a range of facial expressions without looking unnatural. Restylane Refyne and Defyne are the only facial fillers that have been shown in clinical studies to help maintain natural movement and expressions. Restylane Refyne is a dermal filler that helps soften laugh lines (nasolabial folds and marionette lines). It is indicated for injection into the mid-to-deep dermis for correction of moderate to severe facial wrinkles and folds. This can help you restore a more natural look to your face while maintaining your facial expressions. Call the Specialists at Eternal Youth Medical Spa at 505-344-6334 to talk about Restylane Refyne and Defyne today! Come and see for yourself why it’s worth it. 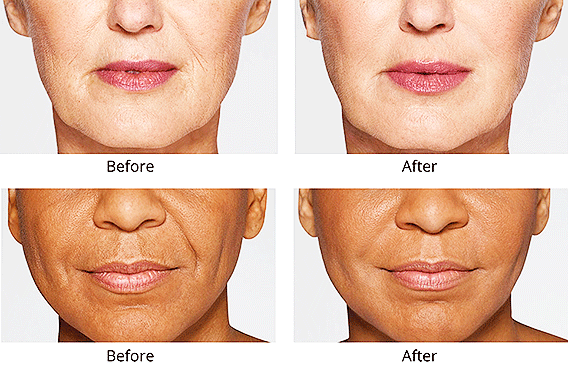 Restylane Defyne is a dermal filler that helps smooth out deep laugh lines (nasolabial folds and marionette lines). It is indicated for injection into the mid-to-deep dermis for correction of severe facial wrinkles and folds. Using innovative cross-linking technology, Restylane Defyne is a hyaluronic acid dermal filler that is able to help restore a more youthful, natural-looking appearance, while helping you maintain your natural expressions.